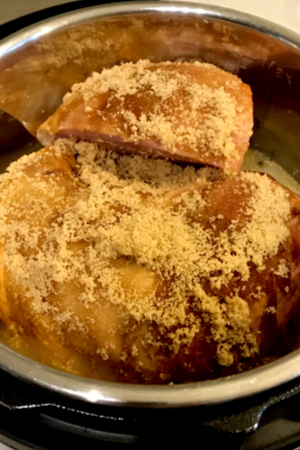 This Instant Pot Bone-In Ham recipe not only helps you save space in your oven, it turns out moist and delicious every time! Instant Pot Bone In Ham cooked and being sliced to serve. When I was deciding on the menu for our upcoming holiday meal I knew that ham would be the main dish that we were going to serve. We have been very fortunate for over the past several years by having a ham gifted to us right before Christmas. We really appreciate the kind gesture and we share the gift with our family and friends at our holiday celebration party. I have always made Honey Glazed Ham in the oven right before the guests are supposed to arrive. 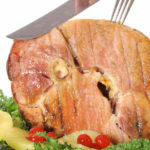 For this recipe we used a precooked bone in ham. But like most parties, there are a few late stragglers that arrive at least a half hour late. So in the meantime, we mingle in the kitchen, enjoy each other’s company and have a few appetizers. I don’t want the ham to get too dry from being heated in the oven, so I take it out and tent it, waiting for the final few guests to arrive. Unfortunately, by the time that we are ready to carve the ham and serve the meal, the ham’s temperature has dropped down to just barely warm. Now don’t get me wrong, it is still delicious, but the whole point of heating an already pre-cooked ham is to serve it while it is nice and hot. So that is why I decided to make Instant Pot Bone In Ham this year! In order for it to fit in my 6 quart Instant Pot, I had to trim down one side. Because the ham is already pre-cooked, all I had to do was to heat it up. And what better way to do that than by using my 6 quart Instant Pot Duo. This left me more room in my oven for the side dishes that requiring browning, such as oven roasted carrots, green bean casserole and roasted Brussels sprouts. And I had to save my slow cooker for my scalloped potatoes. Plus, with the moist heat that is used to pressure cook the ham, I knew that it would be nice and juicy. I have always preferred bone in ham. When cooked, the bone provides so much additional flavor to the meat as compared to a boneless ham. 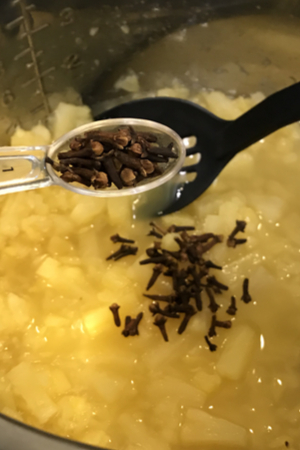 We used classic flavors to season the ham including pineapples and cloves. Yes, it is easier not to have to deal with the bone when carving the ham. But for us we freeze the leftover bone to make ham and bean soup on a cold winter day. 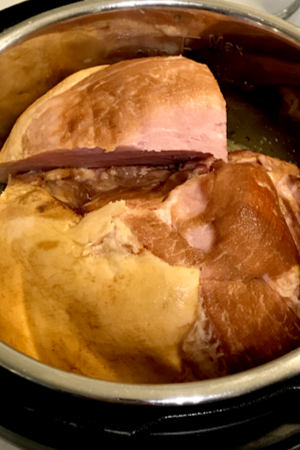 It is really simple to cook the bone in ham in the Instant Pot. But there is one important step that has to be done first. To make sure that it would fit into the liner of the Instant Pot. 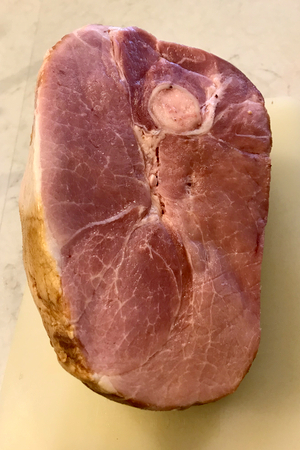 I had a 7.5 lb ham that needed to fit in my 6 quart Instant Pot. It was slightly wider than the liner. So I had to trim down one edge down in order for it all to fit. I placed the ham face down, with the fat side facing up. Then the trimmed piece fit right next to it. Perfect! Place the ham, fat side up directly on top of the liquid. My next task was to choose how to flavor the ham. I stuck with the classic seasonings because I was feeding a crowd. Pineapples and pineapple juice are always a great way to add a little citrus to the ham. And don’t forget about orange juice and cloves. A little brown sugar to coat the top of the ham to add a little extra depth of sweetness, and we were ready to begin the cooking process. The biggest thing to remember is that this recipe calls for an already pre-cooked bone in ham. That means that technically, you don’t have to cook it at all if you don’t want to. But because we like to eat our ham heated up and flavored, we prefer to cook it. We sprinkled the brown sugar on top of the ham so as it heated up it would melt down the sides. Our Instant Pot Bone In Ham was not sliced prior to heating. It was one solid big piece of meat. That meant that it would require a longer cooking time in order for the center to be heated throughout. 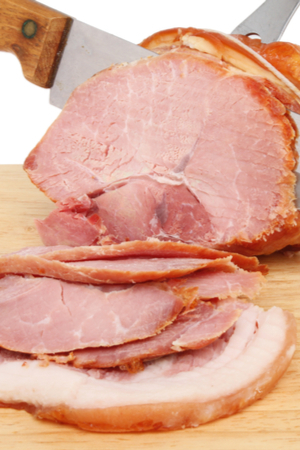 However, if you use a spiral cut pre-cooked ham, the cooking time will need to be reduced. For our 7.5 lb ham 30 minutes of cooking time was perfect. The ham was super moist and was nice and hot. Because ham sizes vary so much we have including the recommended cooking times for both smaller and bigger bone in ham in the recipe below. And if you are looking for a great dessert after you have the ham, try our Homemade Carrot Cake recipe. It’s to die for! 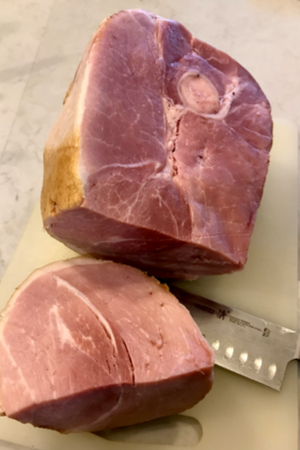 Making a bone-in ham in the Instant Pot not only saves valuable oven space during large meals, but it also tastes delicious and is heated through in a fraction of the time than when placed in the oven. Press the Sauté button. Before the pot display reads HOT pour both cans of pineapple, including their juices, and the orange juice into the liner of the pot. Stir. Add the cloves and ground mustard to the pot and stir well. Place the ham in the pot with the fat side up. You may need to trim a side for it to fit. Place the trimmed piece next to the larger piece. Pour the honey over the top of the ham. Place the lid on the Instant Pot and set the knob to the Sealing position. Press the Meat, Manual or Pressure Cook button and then the + or - button to choose 25 minutes (5-6 lb ham). Be sure to cook on HIGH pressure if you have the option to do so. If you have a 3-4 lb ham, reduce the time to 20 minutes. Increase the cook time for a 7-8 lb. ham for 30 minutes and a 9-10 pound ham for 35 minutes. When cooking time has ended, let the pot perform a Natural Pressure Release for 15 minutes. After that amount of time then release the remaining pressure by turning the knob to venting. If you want to use the drippings to make a gravy, turn the Instant Pot on Sauté. Puree the pineapple with an immersion blender. Make a cornstarch slurry by adding equal parts of cornstarch with cold water. Whisk until smooth and then whisk into the hot liquid. Continue to sauté until the mixture is reduce to a gravy consistency.